When your previous home was registered as a cultural historical landmark, that’s a tough act to follow. Fortunately, the new Steinway Hall in the heart of New York City’s Midtown has appeal, AV innovation, and architectural excellence aplenty—more than enough to make piano purists worldwide welcome the advanced home of this beloved musical brand. The recital hall sports a custom Steinway Lyngdorf system supporting both stereo and immersive formats, with 40-plus channels of digital amplification across 51 individual speakers. Steinway pulled up stakes from its famed Manhattan space on 57th Street to open this breathtaking new location on 43rd Street, selecting Arup to oversee acoustic, audiovisual, IT communications, and security design services for the facility. Close collaboration every step of the way with the firm Selldorf Architects amplified the possibilities for the 19,000-square-foot space consisting of a retail showroom, a 74-seat multipurpose recital room, offices, tuning, and practice rooms. The heart of the space is actually the recital room downstairs, a highly flexible theater ideal for intimate live performances, cinematic showings, and live streaming. It also serves as a recording studio that can capture not only standard acoustic pianos, but also the new Steinway Spirio high-resolution player piano. Artists and audiences alike are treated to a unique experience in the performance space, which sports a custom Steinway Lyngdorf system supporting both stereo and immersive formats including Dolby Atmos and DTS:X. 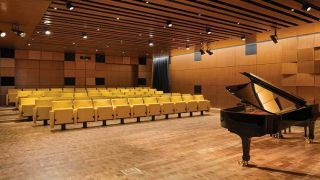 In all, it sports 40-plus channels of digital amplification across 51 individual speakers, and stands as the first Steinway Lyngdorf Model LS immersive sound system installed in a public recital hall worldwide. Blum described the musical result as “cinematic and powerful,” but speech is also clear as a bell due to a separate speech reinforcement system. Two Shure SM58 wireless microphones and six Meyer M4 speakers handle speech duties for introductions, lectures, and panel discussions, while BSS Soundweb audio processing with Dante is used for both music and speech. On the video side, playback in the hall is based on HDBaseT distribution connected via Extron video extension. For video recording, Arup specified three ceiling-mounted Panasonic AW-HE130K 1080p cameras and a Panasonic AV-HS450NJ live switcher.